ISTANBUL, TURKEY - FEBRUARY 22, 2016: View at the courtyard of the Blue Mosque on February 22, 2016 in Istanbul, Turkey. hd00:21ISTANBUL, TURKEY - FEBRUARY 22, 2016: View at the courtyard of the Blue Mosque on February 22, 2016 in Istanbul, Turkey. hd00:21ISTANBUL,TURKEY - DEC 29 : The Blue Mosque at dawn on December 29,2015 in Istanbul,Turkey. It was built from 1609 to 1616, during the rule of Sultan Ahmed I.
hd00:22ISTANBUL, TURKEY, MARCH 2, 2015: The Sultan Ahmed Mosque is a historic mosque in Istanbul. 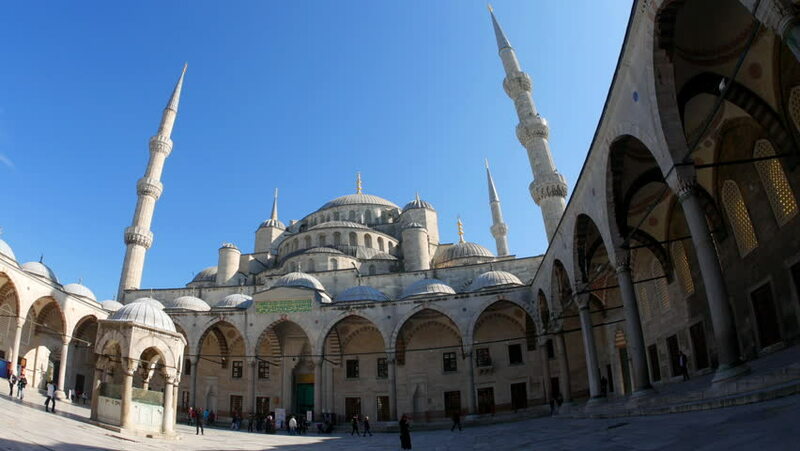 The mosque is popularly known as the Blue Mosque for the blue tiles adorning the walls of its interior.